I didnâ€™t take XaviX seriously when I heard of them over a year ago. I just nodded to myself and thought, â€œBowlingâ€¦ um, I donâ€™t think that’s very high intensity.â€ I noticed that Jackie Chan was sponsoring something for them and I worried about Jackieâ€™s career. While I was ignoring them, they have been working up a sweat. XaviX works similar to PlayStation or Xbox. You buy the console and then you have to buy the games to work with the console. The disadvantage of that is there is another console to hook up to your television. This machine will have to compete for jack space with your VCR, DVD player, and any other game console you have. It might have been better for the consumer if they had created games for the existing consoles. 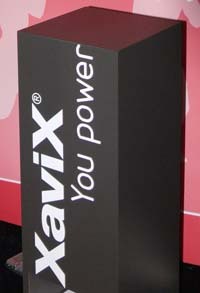 The cool thing about XaviX, though, is that it’s small. It doesn’t need a lot of space next to your television. It’s about the footprint of a Nintendo Gamecube, but as thin as a notebook computer. Another great thing about it is the price. The console is $79.99, which is substantially less expensive than the other gaming consoles around. It can be purchased at the XaviX Webstore. Of course, after looking at Xbox 360 and PlayStation 3 trailers all day, the graphics on the XaviX look very primitive. If I was into ultra-realism, however, I wouldn’t play Powerboxing. I’d probably sign up for real boxing. XaviX isn’t about realism. It’s about moving your body and having some fun while you do it. The games available for Xavix are provided by XaviX only and are limited in number. They are working on new games for the console all the time, but right now, it is very limited. The games that they DO have, however, are very unique. This is not a typical gaming environment. All the games are very active. Not all of them would be considered cardio-vascular, but every single one of them will have you using your body. These games cannot be found anywhere else. I really enjoyed playing with the XaviX games and I have reviews of them coming tomorrow.